Here is Bristol Omnibus Bristol LD6G – 961 EHW – GL8507, new in July 1959, waiting in Gloucester King’s Square for a driver to take out the bus on the short 50B service to York Road (The Cathedrals). Note the Gloucester Coat of Arms and GLOUCESTER on side, applied to about 25 vehicles, part of the agreement when Gloucester City Council leased out its bus services to Bristol Omnibus in 1935 and which continued uninterrupted until Stagecoach took over the services from Western Travel, the privatised company created by NBC. Bristol Omnibus and Gloucester City Council operated these services, overseen by a joint committee. 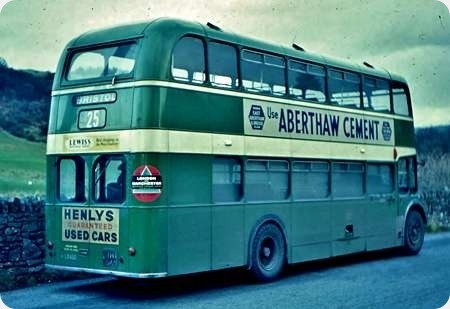 The bus itself was scrapped in Sept 1976. Interestingly Bristol Omnibus and Gloucester Corporation both held their own Road Service Licences for the city (joint) routes. Applications in N&P were listed separately. In York and Bristol, where similar arrangements applied, Road Service Licences were in the joint names of the Corporation and company. N&P listings read "Bristol Omnibus Co. and Bristol Corporation" and "West Yorkshire Road Car Co. and York Corporation". Incidentally the bus is working service 508, formerly 8. A very interesting post Chris. Major Chapple had just left West Yorkshire to take control of the Bristol enterprise, and his experience with the Keighley and York organisational set-up must have proved of great value. Was the Bath situation set up in a similar fashion, or was that a direct acquisition, with it being a company and not a municipality? I am not aware of the BET organisations making similar agreements with municipal fleets, but perhaps someone will be able to tell us if that were the case? Scrapped after only 17 years…What a waste of a thoroughly sound, ideal-for-the-job bus. Or did the Cave-Brown-Cave equipment hasten its demise? My recollection, John W, is that Bristol Omnibus bought, outright, both Bath Electric Tramways Ltd and Bath Tramways Motor Co.. Whether these were municipal or private companies, I don’t know. Again, this was about 1935/36. Southdown and Portsmouth Corporation entered into a fare-sharing operation after the war, having toyed with the idea pre-war.This agreement involved route-balancing at the end of each financial year, a fascinating sight to see for bus enthusiasts. Buses were swapped, but not drivers/conductors. Thus, Southdown buses, staffed by Corporation staff, appeared some years on Corporation routes and vice versa. PD2’s were common to both organisations for some years and usually swapped, but this was not always so, and I recall a Southdown Guy Arab II performing its task one year. The Cave-Brown-Cave heating system, which consisted of the relocation of the engine radiator in two sections to each side of the front of the upper deck, was fitted to quite a number of Lodekkas before the inadequacies of the system led to its abandonment by about 1966. Not only did the efficacy of engine cooling suffer, but the very concept of hot water continually sloshing around at the front of the upper saloon meant that the vehicle interior continued to heat up in the hottest of weather. The early Cave-Brown-Cave Lodekkas had a completely blank front panel with no conventional radiator grille, but these were soon fitted with a front radiator to ease some of the problems. I think that many had the C-B-C completely disconnected, but the equipment each side of the destination indicator remained in situ. I, too, am surprised that this bus should have gone to the scrappers so early, not least because it had a Gardner engine. The ‘in house’ Bristol BVW option was a pretty poor alternative that gave endless trouble from failure of its wet cylinder liners – AEC was not alone in suffering this problem, but Dennis used wet liners successfully from the 1930s, so it could be done. There was no municipal involvement at Bath (or Cheltenham). Bath Electric Tramways and Bath Tramways Motor Co. ceased trading at the end of 1969, their assets transferred to Bristol Omnibus Co., while Cheltenham District Traction was wound up in 1980, 30 years after passing to Bristol control. When the EHW series of Lodekkas appeared in 1959, with CBC heating and hopper vents, there was a heatwave and reports of passengers passing out. Bath Electric Tramways and its motor bus associate business, Bath Tramways Motor Company, were BET companies dating from 1904 that were sold to the Bristol Omnibus Company in 1936. I’m a bit puzzled by the comments expressing surprise that this bus only lasted 17 years. I would have thought 17 years was a reasonable innings for a bus of this period. No doubt its 6LW engine would go on to give many more years service ploughing across the South China Sea! Taking up Roger’s comments on the shortcomings of the Bristol engines I have always wondered if these engines were foisted on the Tilling companies who would have logically chosen the reliable and fuel efficient Gardener given a free hand. Was it that Gardner could not keep up with demands or was it a face saver for Bristol to have at least some Lodekkas with their own engines? The AVW had an equivalent power output to the Gardner 6LW but dimensionally was roughly the same size as a 5LW and an AEC 7.7L. From that you can immediately think that given 40s/50s materials something had to give ie AVW longevity given the close positioning of the 6 bores and higher temperatures. When running well the AVW was a good engine but unlike Gardners which just go on and on even with reduced performance AVW bottom ends tended to go bang with no warning. The BVW coming out at a time of heavier vehicles was never up to the job. I always thought of BT&CC/BOC as a ‘wealthy’ operator. The policy was that most vehicles were replaced at between 12 and 17 years. This compared with the ‘poor’ companies in the same group such as Western National and Thames Valley who kept buses for a lot longer. Remember who was operating the last K & L types in service. I think the reason was competition. Bristol had no competition whatever on urban services in Bristol, Bath, Gloucester, Cheltenham or Weston. The ‘poorer’ companies had less urban routes, large areas of rural routes and faced a certain amount of competition in places. Philip, Bristol had a history of building its own engines right from the outset. Gardner’s economical Diesel engines came onto the scene in the 1930’s and Bristol decided to offer them as an alternative to its own MW and NW petrol engines at that time. However, by the end of the ‘thirties large petrol engines in buses and heavy lorries were in decline as the benefits of Diesel economy and reliability came to the fore, so Bristol’s decision to build its own Diesel engine would have been a quite logical development. The first of a handful of experimental units was fitted to a Bristol T&CC Bristol K5G in 1939 and designated XOW (eXperimental Oil engine – W signifying an engine under Bristol’s system of using letter designations for major units). A dozen engines were then produced in 1946 incorporating various modifications (becoming the VW engine), before production started in earnest, with the engine becoming the more familiar AVW, a 6-cylinder 8.1 litre direct injection engine developing 100bhp @ 1700rpm. The 8.9 litre BVW engine went into production in 1958/59, following trials with a handful of prototypes in 1957. It developed up to 115bhp@1700rpm, although operators could have the unit derated to give 105bhp@1700rpm if required. Unlike the AVW, which had an aluminium crankcase mated to a cast iron cylinder block with dry liners, the BVW had a one-piece cast iron crankcase/cylinder block assembly and wet liners. West Yorkshire’s BVW engines generally proved reliable workhorses, with many achieving over 300,000 miles between overhauls. True the wet liners did require attention from time to time, as the neoprene sealing rings started to perish with age. The usual giveaway was water weeping out of small ‘tell-tale’ holes on the side of the cylinder block – each cylinder having its own set of holes. It was advisable to replace sealing rings on all six cylinder liners even if only one was weeping, as the others being of similar age, would no doubt soon follow suit. As such things as cylinder heads, sump, inlet and exhaust manifolds, water rails, hoses etc had to be removed in order to remove one liner (plus its piston and conrod), it was certainly more expedient to only have to remove these items once rather than up to six times as each cylinder’s rings failed in turn! (Yes it does sound like common sense but…….!). The liners could be removed and replaced using a hand-operated hydraulic pump, with the engine remaining in situ, and piston ring and bore wear never seemed to be a real issue on WY’s BVWs, whether the Lodekkas so fitted had CBC or conventional radiators. Relating to the supply of Gardner engines, I think it is often forgotten that although Gardner was a premium engine builder, it did not only supply much of the bus and truck industry, but also supplied a sizeable section of the marine market as well. This not only included manufacture of marine engines of various sizes, but also the manufacture of the reversing gear to go with them. Gardner at one point also had healthy orders for the supply of engines for mobile compressors and mechanical excavators. Although Gardner did increase engine production over the years, I often wondered if maybe they just did not physically have the room for expansion at their Patricroft works. This was already quite large, and incorporated aluminium, iron and brass foundries, pattern shops, castings stores and machine shops, drawing offices, engine building/testing shops, various stores and service departments, a power house, and a R&D department. Most importantly there was a large canteen on the site, which I remember using on my first visit there as a WY apprentice more years ago now than I care to remember. The apple pie and custard was beautiful! Thank you, Brendan, for your contribution on the BVW from someone with actual hands-on experience. These are always useful, informative and welcome. My observation is that Crosville used the BVW on all except the last (F-reg) FLFs, and non were ever changed for Gardners, so the BVW must have had something going for it. For me, the combination of BVW engine and Bristol 5-speed gearbox made the most pleasing and harmonious sound of any PSV. I would like to endorse what Alan W has said about the excellent contribution made by Brendan. I was a regular user of the West Yorkshire Road Car Company services in the fifties and early sixties and know what an excellent bus fleet they operated with tight control from Harrogate. They operated over avery wide area including urban routes in Harrogate, Bradford, Leeds, Keighley and York as well as many rural routes such as to the East Coast and Yorkshire Dales. I always regarded WYRCC as an ex Tilling flagship company with an intention to always have a modern image efficient fleet, so bus life generally was no more than 16 years. Sadly all these wonderful attributes changed in 1968 with the imposition of the National Bus Company and later the demise of the Bristol Commercial Vehicle Company and Eastern Coach Works in the eighties was the final nail in the coffin. Richard, obviously some were better than others, but in general the same could be said about most of the former Tilling Group companies, it certainly applied to United Automobile Services in this area. The vast majority of BET companies were also well run, but that all went out the window post 1968 when NBC ‘No Body Cares’ sorry, National Bus Company took control. A few choice ones that are not fit for publication, but its strange how nobody seems to have a good word to say about that particular government folly. As for the demise on Bristol and ECW? The same thing happened to AEC, Daimler and GUY when they were all lumped together under the control of British Leyland, not to be confused with Leyland Motors. After several years of development the end result was the Leyland National. The later ones were actually quite a good vehicle, but the early versions were an absolute abortion that would never have survived healthy competition had there been any, but operators were given two choices, take it or leave it, because there isn’t anything else. How could they have spent so much time and money on development and got it so wrong. This is only my opinion. However, at the time I was a driver for NGT at their Percy Main Depot, although running at a profit was essential for the survival of the company, it was run by people who knew the bus industry, and our vehicles were well turned out and maintained to a very high standard. Enter the new regime of NBC, they are run by government appointed accountants, most of whom have never been on a bus since they left school, but they know the price of everything and the value of nothing. They apply the principle of find the lowest common denominator, as a result, pride in fleets is destroyed, standards drop, and once well turned out fleets now just look shabby and neglected. The suffocating hand of NBC didn’t happen until the Tory government of Edward Heath appointed Croda industrialist (and twice failed Conservative parliamentary candidate) Freddie Wood in 1972. Croda was a company supplying chemical products to the beauty products industry, and Wood was a believer in extracting high margins from modest sales volumes. He brought the Croda creed to an industry of which he was totally ignorant, believing that those backward bus passengers required a bland, countrywide brand to become aware of the services on offer. Buses should be sold like supermarket baked beans by inventing a new, uniform, national identity. A public transport user in Aldershot could only then appreciate the "products" on offer if a bus passenger in Bristol or Buxton was given identical branding and operating standards. Crucially also, not just profitability but notably good margins to satisfy his political overlords were the prime objectives. Cost control (and corner cutting) became paramount. The rest is history. For whatever reason though Bristol engines were never made in large quantities so operators were either ultra conservative or whole life costs were higher than Gardner/Leyland. Allan and Richard, thank you for your kind comments. I enjoyed every minute of my eighteen years working for West Yorkshire (fourteen of those in the engine shop), and even in its NBC corporate days the Company tried its best to maintain certain standards. Much of this was no doubt due to the people in charge, including in later years Brian Horner, the general manager and Tom Fox, the chief engineer. The Company did fall short at times when circumstances seemed to conspire against it, and there were periods when buses had to be hired from other NBC subsidiaries just to keep the show on the road, but such situations were not peculiar to just West Yorkshire at the time. Ronnie and Roger (C), you have both raised very valid points about NBC, the corporate identity and the bone paring thrust upon it by Freddie Wood, and I tend to agree with much of what you have both said. In the ‘seventies the mantra was often "big is beautiful", and any large company worth it’s salt ‘had’ to have a corporate identity and a logo, which presumably wooed Freddie Wood. British Leyland was another case in point, and following all the various takeovers and mergers "became too big to be allowed to fail" as the modern saying goes. So when it eventually did in 1974, it was taken into state ownership to protect thousands of jobs. A shame then that this was not appreciated by certain sections of the workforce, and in the bus and truck world the arrogant attitude of some members of British Leyland’s senior management towards its customers probably did not help matters either. Roger (B), probably the main reason that Bristol engines were not made in such large quantities was to do with the ‘closed market’ within which Bristol was required to operate. There was an expectation for it (and ECW) to operate at a profit, despite being denied the potential to expand its market by the private sector, so maybe Bristol endeavoured to produce as much ‘in-house’ as it possibly could. On the subject of engines, it is interesting to note that while Bristol chose not to offer Leyland engines in its buses and coaches through the ‘fifties until the mid-sixties, it did do so with its lorries of the period. Could it have been that the Bristol AVW and BVW engines could not provide the extra power required for road haulage operations? From a purely selfish point of view, what a pity we were denied the opportunity to savour such delights as a Leyland-engined Bristol K, L, LS, or Lodekka LD. It has also deprived Roger of carrying out one of his beautiful restorations on such a beast. Unless the opportunity arises for a conversion Roger…..?! Roger (Cox) has hit the nail on the head. NBC gets a lot of flack for happenings which were not of NBC’ s making. I worked for NBC in the early years. People should remember that "local" management was still staffed by exactly the same people who had managed the companies in Tilling and BET days, and who were "bus men" through and through. The "bean counters" and those who acted as middle men between NBC and the Government were the problem,together with those who refused to see that the prime object of business is to make a profit and not sponge off the public purse. There was nothing wrong with NBC as concept, and there was certainly nothing wrong with the Leyland National (as a concept) – it should have been the finest bus ever built. However changes in political thought and undue interference from those "on a power trip" is always a recipe for disaster. NBC was conceived as a much enlarged THC, and Central Activities could have been a highly profitable coach operation, but their potentials were never realised. The only saving grace was that the PTE s and deregulation/privatisation were even bigger disasters (financially) than NBC ! Gardners were marine engine builders primarily. It was Bartons at Chilwell who first used Gardner engines in buses – Simon Barton’s grandfather was the first to fit them! Stolen Gardner bus engines have turned up fitted to ships. The Royal Hong Kong Police arrested a junk in 1979 which was fitted with a Gardner 6LX which had been stolen from the burnt out wreckage of Belfast Corporation Daimler Fleetline No. 714 (714 UZ) which had been hi-jacked and burned on 21st July 1972 at North Queen Street, Belfast! The route balancing described above between Southdown and Portsmouth also applied in Bristol between the City services and the Country services when I was there in the 1960s. In summer there were extensive weekend reliefs on Bristol to Weston-Super-Mare, which were turn up and go with a constant queue, and City KSWs were loaned for this, possibly as much for staff availability as for vehicle supply. To maintain the mileage balance Country service vehicles could be seen from time to time on City routes. I don’t remember any "On hire to …" notices were necessary in the window. In response to Bill’s post above, I also remember the bank holiday’s on service 24 as the Bristol to Weston-super-Mare route then was. Living on the Weston side of the city we had to try to board on the outskirts of the city. We waited ages for a bus with any space and usually had to stand the whole way. ‘On hire’ notices were not necessary as there was no difference between the legal lettering of BJS (i.e. Bristol City services) and Country service buses. Country buses operating on BJS routes were known as ‘B fleet’ duties. Athough they would balance the use of City buses on country routes at bank holidays, the primary purpose was to balance up for mileage operated by BJS vehicles on parts of BJS routes outside of the city boundary. As an example, at that time, Kingswood was outside of the city but had a BJS bus service from the city centre. The mileage from the boundary to the terminus and back worked by a BJS bus would be calculated and that amount of mileage would then be worked by a country bus on a BJS route. I just find it odd that at a time when such things had to be done either on a comptometer or even manually, they worked it out to the last furlong; now we have computers, I doubt whether anyone would bother. Among the 250 LD chassis built in 1957 as the 134th sanction were scattered six chassis to the new legal length on two axles of 30ft. They are generally referred to as type LDL, but I have seen LLD used in some factory documents. Bristol Omnibus L8450 is numerically the last and seen here looking miserable in late 1962 at the Holly Lane, Clevedon terminus of service 25. I seem to remember that as well as being the first 30ft long Bristol double deckers, instead of the then standard vacuum assisted hydraulic system, they had compressed air servo hydraulic brakes, as later adopted for the Flat Floor (F) series chassis. Whether the LDL had air suspension, I can’t recall. Perhaps the last eight vehicles of the 138th sanction, designated LDS that went to Brighton, were used for air suspension trials, which also became a very successful standard on the F series (and eventually the RE!). As a graduate trainee at BOC, I remember being allocated this vehicle for an evening overtime duty. As a novice driver, with a full load at Bristol Bus Station, to my embarrassment, I was unable to release the handbrake! A helpful inspector recommended depressing the footbrake at the same time and hey presto all was well! The Lodekka front cowl hitherto had a single foot hold each side of the central number plate, but these six and subsequent flat floor models had a step to accommodate two feet to the nearside. The ECW body is distinguished by having an extra short bay upstairs, otherwise you may miss the longer last bay downstairs. There was also an extra emergency exit – the saloon window behind the cab would open. It retained the original rear door window layout with the larger radius top corners towards the centreline, rather than the arrangement on the F series where the larger radius top corners were outboard. The six vehicles must have been very successful prototypes as they stayed in service in one form or another for a good lifetime. Comparing this photo with photos of a ‘conventional’ 27ft LD it seems the extra length for the 30 foot LDL was all accommodated in the rear overhang. In other words the wheelbase seems to be the same for both models. Have I got this right or is it a trick of camera angle on the photos? If this is the case it must have pushed the Construction and Use Regulations to the limit! Another great view from your collection, Geoff! I have a view of one of the VDV series in my pile of forthcoming submissions to Peter. Philip, I don’t think that is quite right. The LDL body had the same window spacing as the FL, and F-series window bays were slightly longer than those on an LD. The wheelbase of the LDL would therefore have been slightly longer than for an LD. The FL had its rear axle further back still, so that it straddles the last long bay and the short bay. Possibly experience with the LDLs led to this change. It’s also noteworthy that the driver’s cab offside windows in the LDL are of the pattern used for the F-series, i.e. with a straight lower edge. Philip, it does appear at first glance that the LDL Lodekka’s extra length was achieved simply by lengthening the rear overhang. However, the LDL had a longer wheelbase than the LD (18ft-6ins as opposed to 16ft-8.5ins) allowing the chassis outriggers and corresponding body pillars to be spaced further apart. You would never guess this initially from the photo though would you? 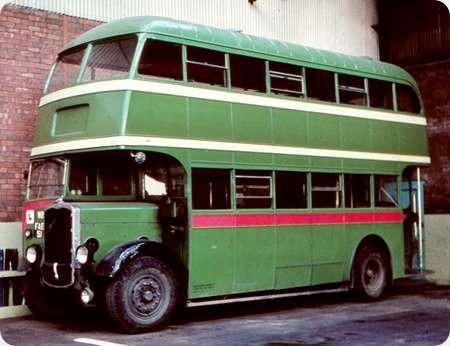 Personally I prefer Bristol-ECW’s positioning of the short extra bay towards the rear on the LDL, rather than amidships as on AEC-Park Royal’s 30ft version of the Routemaster. Bristol-ECW’s treatment looks neater somehow. (Dons tin hat and waits to be hit over head with tin tray). Geoff, I believe that whereas Bristol designated the long wheelbase model LDL, for some reason ECW referred to the design as LLD, the ‘alternative’ designation you mention in your text. Also, from memory the fitting of an emergency exit on the offside towards the front was a legal requirement on double deckers of this length, regardless of whether or not platform doors were fitted. Your embarrassing moment with the handbrake reminded me of a somewhat similar embarrassment I had as a West Yorkshire Central Works apprentice, serving a three-month stint at Harrogate’s Grove Park depot. I had been asked by my fitter Johnny Berry to bring a dual-purpose MW up from the bottom end of the depot and park it up at the top end. All went well until it came to stopping the engine. Could I find a push or pull type stop button or a stop switch? I left the bus defiantly ticking over with the handbrake on, and asked Johnny – an easy going fitter who also had a love of buses and coaches – how to stop the little blighter. He just said, tongue-in-cheek, that it was up to me to find out! Not to be thwarted, I double-checked the handbrake was fully on, stepped on the footbrake, put the MW into gear and let the clutch pedal up and the bus gave up without a struggle. Johnny said he was impressed, but said if I had simply pulled the accelerator pedal fully up it would have stopped the engine! I would have known this if I’d been brought up on older Bristols, he mentioned with a wry smile. Lovely man. Happy days. Brendan, I don’t know when a lower deck emergency door at the front became a legal requirement. This is a 1957 vehicle, and yet the NGT Group and NCT 30ft PD3’s of 1958, didn’t have one. I wonder whether the lower deck emergency door requirement depended on seating capacity? 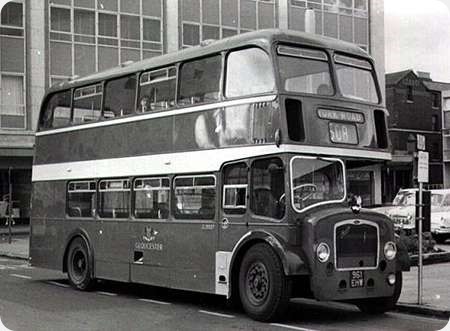 In July 1959 Portsmouth Corporation took delivery of five Leyland PD3/6 with Orion bodywork. The layout was H36/28R, so just 64 seats in a 30-footer. There was no off-side lower-deck emergency door on these as delivered. However, between Nov 1961 and Nov 1962, they were all up-seated to H38/32R. Now seating 70 (still with an open rear entrance), they were all fitted with an off-side emergency door, in the front bay behind the driver’s cab. This modification was carried out when each was re-seated. The local enthusiast understanding at the time (of the school-boy variety) was that the seating increase was the cause of the emergency door fitment. However such hear-say does not necessarily have a basis in fact. Intriguing information indeed Ronnie and Michael, which has caused some head scratching at this end, leading to a splinter in me finger. I do remember Leeds CT’s 30ft rear entrance Roe-bodied CVG6LX/30s and Regent Vs (MCW and Roe-bodied examples) having emergency exit windows in the first offside bay. I also thought that LCT’s 30ft Roe-bodied Titan PD3s of 1958 had them, but have now seen photographic evidence that proves otherwise! Could it be that the Construction & Use regulations were changed at some point along the lines of "vehicles built after a certain date must have…."? The plot thickens as they say. Sheffield had 71 rear entrance Regent Vs in 1960 – delivered between January and April. The 25 Roes had platform doors and a rear emergency door – but none behind the driver. The 26 Weymanns had no emergency exit behind the driver. The last to arrive were the 20 Alexanders which DID have the emergency exit behind the driver. One can only surmise that regulations changed during the build &/or delivery of these vehicles. This interesting aspect concerning additional emergency exits confirms my present day terror about riding on most modern double deckers carrying around ninety persons. As if the lack of a central normal exit isn’t bad enough – causing havoc to punctual running but that’s another topic – there is only the tiniest slender emergency door at the rear offside of the lower saloons. In many cases this "arrow slit" is further reduced at its lower end by a rigid armrest for the long seat for five. I just cringe at the thought of an engine fire, or of the front door being disabled in an accident as there could only by mass panic in the manner of recent tragic football ground carnages. The often found alternative "in emergency break glass" is a farce too – so if you survive the emergency incident per se you risk being cut to ribbons by the alternative. I freely admit to avoiding travelling on any bus where there are huge numbers of standing passengers in addition to to oversized buggies and "staircase gangway blockers – I’m only going a couple of stops." Melodramatic I may admittedly sound, but I’m sorry to say that today’s double deckers in particular are a disaster waiting to happen – and we won’t stray here onto today’s criminally overcrowded trains. The Aldershot & District Loline I buses of 1958 had rear entrance bodies with doors but no offside emergency exit. The front entrance Loline IIIs of 1961 onwards had emergency exits on the offside rear. However, the batch of City of Oxford front entrance Dennis Loline IIs also of 1961, albeit of 27ft 6ins length, had no offside emergency door. The Halifax Front entrance PD3s of 1959 did have a rear offside emergency exit. Operator discretion seems to have applied up to about 1960, but somewhere about then the rules must have changed. I’ve tried to find the regulations on the internet, but historic data seems to be rather elusive. Further thoughts – the possible provision of a centre rear emergency exit may explain the absence of an offside door on the Oxford Lolines. My high mileage memory can’t now recall if they were so fitted. I think you may be onto something with your centre rear emergency exit theory Roger. ECW did not fit offside emergency exits on the Lodekka FSF/FLF bodies, and Northern Counties halfcab front entrance ‘decker bodies do not appear to have had them either. Both designs did however have their emergency exit door mounted centrally within the lower deck rear bulkhead. Going back to rear entrance double-deckers, LT’s first 30ft long Routemasters, delivered in 1961, had emergency exit windows on the offside. In Ken Blacker’s excellent book ‘Routemaster’ he describes the main features of the initial batch of RMLs, and then goes on to state: "Also new was the provision of a quick release emergency window in the second offside bay of the lower saloon to provide the secondary means of escape required by law for vehicles of this length". Unfortunately we’re still no nearer knowing when such legislation was introduced. As you say, related information on the internet does indeed seem to be rather elusive. I think I’ve got it. It seems to be about lower deck seating capacity and the positions of other exits, and it dates from 1958. (a) A half-decked vehicle, a single-decked vehicle with permanent top and the lower deck of a double-decked vehicle shall be provided with not less than two exits (one of which may be an emergency exit) which shall not both be situated on the same side of the vehicle. According to Commercial Motor, November 13th 1953, the Construction and Use regulations were to be changed as "The Ministry says that the dangers of having both exits at one end of the vehicle have been increased by the use of large underfloor-engined single deckers, and particularly crush-loaders. Consequently, it is proposed that in a single-decker or on the lower deck of a double-decker, each seating more than 28 people, one exit shall be at least 10 ft. forward of the other, taking the measurement opposite the centre of each exit at gangway level." Hence why the FLF Lodekkas had the emergency door at the back, whereas the LDL had the additional door at the front. Peter and Peter, thank you very much indeed for solving the emergency exit window mystery for us. In only a matter of days, the ‘OBP Supersleuths’ have won through yet again. Thanks seconded! I’ve been wondering for some time whether Construction and Use regulations still exist, perhaps under another name. Googling has thrown up quite a lot on accessibility for the disabled, but nothing on other aspects of design and build. Could someone point me in the right direction? Thanks. So the school-boy enthusiasts in Portsmouth weren’t wrong! But I doubt if any of them had read the C&U regulations – I certainly hadn’t. But thank you to both Peters for tracking down the detail, so that we are all now wiser, as well as just older. With the exception of the Eastern National example 236 LNO which had the same 19ft 2in wheelbase as the FL, the other LDLs had an 18ft 8in wheelbase. There was also the 1966 LDL, a paper exercise for what I’ve read described as a Bristol Arab V, that would have had an 18ft 6in wheelbase. I was a conductor at H & D Poole in the late 1970’s and we had a couple of these lengthened versions. The one thing I do remember is that they rode much more smoothly than the normal versions, even the rougher drivers couldn’t send you down the bus. Unfortunately although I passed my test in early 1979 I never got to drive one. Unlike the standard RMLs, the RCL Green Line version didn’t have an emergency window fitted to the offside second bay. In his book "Routemaster", Ken Blacker states that "…they had no emergency window fitted into the offside of the lower deck as the one on the rear platform met the legislation". It would seem from previous comments that it more likely one wasn’t required as they only seated 29 in the lower deck. If London Country (and later London Transport in 1980) had upseated them to the normal capacity of 72 on being relegated to bus duties presumably an emergency window would have needed to be fitted. Luckily that didn’t happen and they continued to offer a far superior ride!